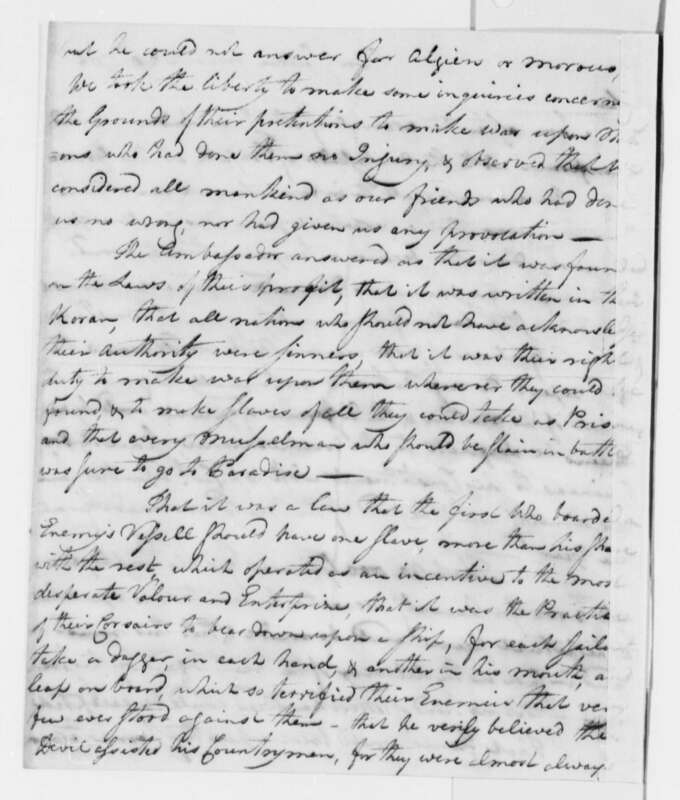 9 Thomas Jefferson to Archibald Stuart 1779 or 1799? 10 Rev. Ethan Allen & "No nation..."
11 "Dissent is the highest form of patriotism." 12 "The price of freedom is eternal vigilance." 17 Merge from "Decalogue of Canons"
18 Why no Quotes on Jefferson's views on Banking? 25 Disputed "issuing power" and "If the American people ever allow private banks..."
28 "Mob rule" quote sourced? 29 Timothy Dwight quote about Jefferson? 34 Is this a legit quote? 36 Truth will do well enough if left to shift for herself. 38 "Widespread poverty and concentrated wealth"? "Paper is poverty...it is the ghost of money, and not money itself." Thomas Jefferson I can not find anything about this quote as to when or where it came from. Does this mean it is fake? Thanks in advance. This article features several quotes attributed to Jefferson which if accurate should presumably be recorded under the section on Race, even if, or especially because, they don't show Jefferson in a great light. The article is reporting the comments of Dr Joy DeGruy-Leary (author of Post Traumatic Slave Syndrome: America's Legacy of Enduring Injury and Healing). If anyone has access to the work that might help if it is footnoted. I'd note also the lady in question has no wiki page to her name as yet. "I have sworn upon the altar of god, eternal hostility against any form of tyrrany over the mind of man." I always heard it as "I have sworn upon the altar of god eternal, hostility..." I am unsure as to the location of the comma in the original. Does anyone have a link to the original? The Library of Congress has the document where this quote appears: a letter to Benjamin Rush, 23 September 1800. If you go to http://memory.loc.gov/cgi-bin/query/r?ammem/mtj:@field(DOCID+@lit(tj090069)) you can view the transcription as well as link to images of the original. I have just noticed that some remarks of Jefferson and Lincoln have today been posted, that anyone who is aware of history, and the pervasive influence of racist presumptions know are possibly, or even probably genuine, — I am familiar with such remarks by both men, and have not yet bothered to do any search to see whether these are accurate or not. Both quotations seem accurate, and do reflect the appalling prevelance of racism and other forms of bigotry in human history. If the poster was attempting to show the deficiency of these individuals, rather than support for the inane ideas expressed, it should be remembered, that social environments shape one's ideas and perceptions, but the truly great focus upon shaping social environments through expressions that are true and beneficial, rather than those that are false or create needless hostilities and resentments. I have recently been examining all the known superstitions of the world, and do not find in our particular superstition [Christianity] one redeeming feature. They are all alike, founded upon fables and mythologies. After extensive searches this quotation though it sounds plausible, may well be spurious. Two sources have been mentioned: "The Jefferson Bible" and a Letter to a "Dr. Wood" with no date given, but the accuracy of either of these citations remains dubious, and I have not yet been able to reliably verify them. If anyone else can, please do so. The Jefferson Foundation believes it to be spurious, based on their digital searches of his corpus. Unsurprising, since in the form lacking "Orthodox" it contradicts his various other substantiated views. "I hope we shall crush in its birth the aristocracy of our moneyed corporations which dare already to challenge our government to a trial of strength and bid defiance to the laws our country". "I hope we shall take warning from the example and crush in it's [sic] birth the aristocracy of our monied corporations which dare already to challenge our government to a trial of strength and bid defiance to the laws our country." The "example" is that of England, as preceding sentences make sure; thus many pages on the Web quote these sentences as "... from the example of England and crush...". 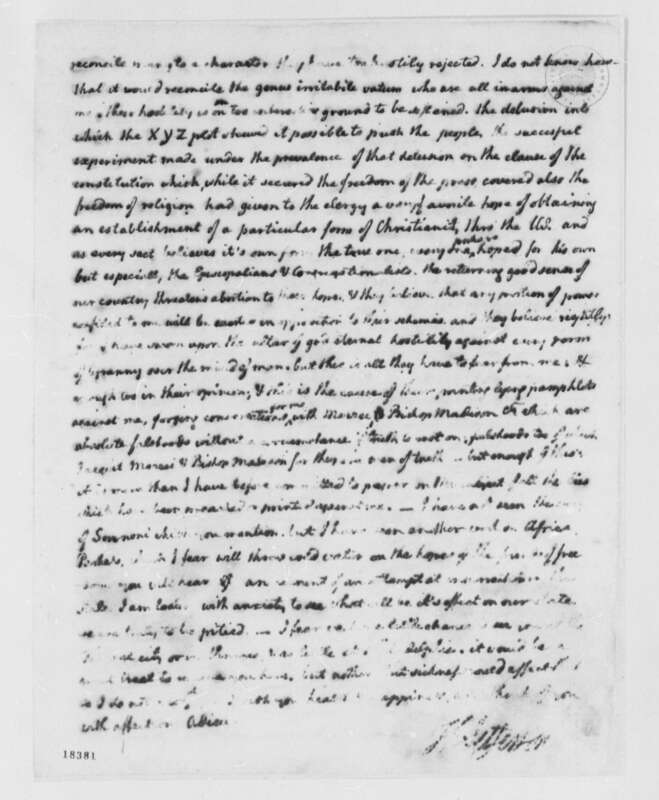 Thomas Jefferson to Archibald Stuart 1779 or 1799? This is one of my favorite Jefferson quotes, but after some searching it may be spurious. Which is accurate? And if the 1779 quotation has been fabricated, who was the first to publish it online? I am posting it here as well for easy comparison, and as an illustration of how quotations are often edited differently to emphasize different points (and unfortunately to sometimes have the authors seem to make points entirely different or even contrary to what they originally meant). Rev. Ethan Allen & "No nation..."
No nation has ever yet existed or been governed without religion. Nor can be. The Christian religion is the best religion that has ever been given to man and I, as chief Magistrate of this nation, am bound to give it the sanction of my example. Good morning Sir. Allen was 12 when Jefferson retired the presidency. Whenever was TJ Chief magistrate? WAIT, Zinn might have said it, but quoting Mark Steyn in his Washington Post article on May 1, 2006: "As far as I can tell, it was Nadine Strosser, the American Civil Liberties Union's head honcho, who cooked up the Jefferson fake. At any rate, she seems to be the only one who ever deployed it prior to September 11, 2001. Since then, however, it's gone nuclear" If this can be verified, then Zinn's July 2002 interview is not the original utterance of this quote. This is clearly NOT Jefferson, but be careful about possibly misattributing this quote a second time. The above is misleading... as his quote appears in the book "One Nation Two Cultures" written by Gertrude Himmelfarb in 1999. She cites it as coming from an article in a publication called Civilization April/May 1998, p. 39 by Nicholas von Hoffman. In the text she says "A recently discovered handwritten history of a Washington parish recounts his exchange with a friend who happened to meet him on his way to church..."
And who is Rev. Ethan Allen? The son of the Revolutionary? He had a son named Ethan, but the birth dates are wrong. This book citation does not attribute it to Ethan Allen. I'm not certain whether TJ ever actually said this. I found claims attributing the quotation to at least two other authors. Here it says that this quotation is misattributed to TJ but the closest known quotation comes from John Philpot Curran. On Bartleby it's attributed to Wendell Phillips. While it mentions the frequent attribution to Jefferson, it again says no evidence exists to support such attribution. Most telling is that at least a google search does not unearth any attribution specifying a source. "The legitimate powers of government extend to such acts only as are injurious to others. But it does me no injury for my neighbor to say there are twenty gods or no God. It neither picks my pocket nor breaks my leg." This quote is attributed to 'Notes on Virginia (1782)' Does anyone know where this document can be found? Wikisource doesn't have any similar document. I'm looking for a source from the following quote, attributed to Jefferson: “If people let government decide what foods they eat and what medicines they take, their bodies will soon be in as sorry a state as are the souls of those who live under tyranny." I have searched Bartlett's quotations, Simpson's Quotations, Columbia Quotations and Respectfully Quoted and come up empty. When I Google the entire "quote", the only hits are alternative medicine, holistic medicine, drug freedom and organic webistes and blogs. I'm beginning to believe that this is a totally fabricated quote. Can anybody find a legitimate source for this? "Was the government to prescribe to us our medicine and diet, our bodies would be in such keeping as our souls are now. Thus in France the emetic was once forbidden as a medicine, and the potatoe as an article of food." My understanding is that this quote is by one of the signers of the Declaration of Independence, but not Jefferson himself. I do not remember the name as he was not as popular as some of the others like Jefferson. I would like to locate the source also. (Unless I have the quote and source confused with . . . Also, it is my understanding that there is a quote stating something to the effect that if we remove God from our educational institutions where the 10 commandments teach right from wrong, then society will no longer understand right from wrong eliminating a value system and the government will reap the consequences through extensive policeing of its society. This was a quote from one of our founding fathers. I would like to know the exact quote and who quoted it. Any resources on this one, too?) As an afterthough, Trinity Broadcasting had this information on some of these quotes in a special program on our founding fathers and education. This info could possibly be found there.) : —This unsigned comment is by 24.99.109.22 (talk • contribs) . I am going to add "A society that will trade a little liberty for a little order will lose both, and deserve neither". This is a quote that is also attributed in another form to Benjamin Franklin. Since they lived at the same time, it's not unreasonable to think they may have said similar things. Merge from "Decalogue of Canons"
Why no Quotes on Jefferson's views on Banking? I can think of several relevant quotes jefferson made on central banking. How come you "wikipedians" summarily delete something that easy to document? it's like summarily deleting every sentence on wikipedia that isnt sourced. Aren't you supposed to have any knowledge in the field before you revert? I'd consider it vandalism not to do a simple search to verify that your deletion is a proper one. 1) The first quote you entered (the 1816 letter to John Taylor) was not deleted. It has been moved to its proper chronological place among the Sourced quotes. If you had looked at the changes in the article since you added the quote, you would have seen that this was so. 2) You have now added more quotes. These too have been added without regard to chronology. They will have to be re-arranged according to dates. I'm sorry that I didn't see your replies before now. I will try to follow your guidelines and hope that I follow wiki's rules reasonably well. But like Kalki indicates it is very difficult to access all the specific data, and I would think that citing proper official sources would be sufficient until someone with access to Library of Congress and other sources can properly verify them for more exact details. But on a side note: Perhaps it would be a good idea to more thoroughly sort quotes in topics for ease of reference as the number of quotes increase. It is very difficult to find a quote if you do not know the exact phrasing(?) when looking for quotes on a specific topic. The only TJ quote I have not been able to verify, but yet it seems like one of the bogus one. Any help on this one? I have sometimes thought of translating Epictetus (for he has never been tolerable translated into English) by adding the genuine doctrines of Epicurus from the Syntagma of Gassendi, and an abstract from the Evangelists of whatever has the stamp of the eloquence and fine imagination of Jesus. The last I attempted too hastily some twelve or fifteen years ago. It was the work of two or three nights only, at Washington, after getting through the evening task of reading the letters and papers of the day. But with one foot in the grave, these are now idle projects for me. I always thought that “I am a revolutionary so my son can be a farmer so his son can be a poet.” (John Adams) was said by Jefferson and I've seen this this elsewhere. Doing a search on Google I found this website: http://timpanogos.wordpress.com/2006/07/26/false-quotes-department-jefferson-kerry-tim-and-josh/ Which states that John Adams said this. I'm not very good editing these various Wikipages, but maybe someone out there can add this to misattributed section on Jefferson and to the quotes on Adams? "That to compel a man to furnish contributions of money for the propagation of opinions which he disbelieves and abhors, is sinful and tyrannical" This quote is listed under "Sourced" and "Unsourced". —This unsigned comment is by 70.11.73.136 (talk • contribs) . 1. Does the creation of a page on Jefferson's religious views mean that it will also include quotes that are not in the section "On religious matters"? Will it become the repository, in short, of all Jefferson's quotes on religion, or will the Thomas Jefferson and Notes on the State of Virginia articles continue to include some quotations as well? I actually object to such subtopics here and everywhere, and am very sorry I had anything to do with the creation of one of these, years ago. I believe there was a page imported from Wikipedia which contained many of the current quotes on religion, which I didn't have time to deal with fully, so I created the subtopic section. The extreme overuse and abuse of such sections by others leads me to oppose them now, and even more so a page dedicated to such specialized sub-topics. I had been meaning to work on this page for some time, to eliminate these sections, but many other things have kept me busy. Sufficient evidence exists that Thomas Paine wrote the Declaration of Independence and Thomas Jefferson copied it. Rewrite the intro so it does not say Jefferson is the author. —This unsigned comment is by 71.213.237.41 (talk • contribs) . That Thomas Paine bit is nonsense, but I do take issue with inclusion of the Declaration in its final form. TJ wrote the draft, but it underwent editing first by the rest of the committee-i.e., Franklin and Adams-and then the Second Congress. E.g., Jefferson wrote "We hold these truths to be sacred and undeniable", and the change to "self-evident" was only made later. At the least, should there be a note mentioning the committee markups? Disputed "issuing power" and "If the American people ever allow private banks..."
This is cited as from a letter to Secretary of the Treasury Albert Gallatin (1802) in Flight to Financial Freedom - Fasten Your Finances (2007) by Nathan A. Martin, and earlier appears in How to Take Advantage of the People Who Are Trying to Take Advantage of You (2006) by Joseph Stephen Breese Morse, p. 51. It appears to be a concoction of some actual statements by Jefferson, and others that may not be. It has not yet been found to appear earlier in precisely this form. Respectfully Quoted says this is "obviously spurious", noting that the OED's earliest citation for the word "deflation" is from 1920. Variant: I believe that banking institutions are more dangerous to our liberties than standing armies. Already they have raised up a monied aristocracy that has set the Government at defiance. The issuing power should be taken from the banks and restored to the people, to whom it properly belongs. This is an earlier variant which contains a portion of the above statement and appears in Life Work of Thomas L. Nugent (1896) compiled by Catharine Nugent. Both of these expressions appear to mix a well documented statement that is to be found in Jefferson's published letters, and poorly documented ones which do not. The only portions of them thus far definitely sourced to Jefferson occur in a letter to John Taylor (28 May 1816) [ME 15:23]: "I sincerely believe, with you, that banking establishments are more dangerous than standing armies; and that the principle of spending money to be paid by posterity, under the name of funding, is but swindling futurity on a large scale." This is quoted more extensively in the sourced section. Since the part " If the American people ever allow private ... conquered." has a separate origin and is more obviously bogus, I moved it to Misattributed. The quotes appeared separately more often than together until the last few years. After much searching, I haven't been able to find the original letter anywhere. I've found other letters from Mr. Jefferson to Mr. Van der Kemp, but none of them contain this quote. Does anyone have a credible source for the letter? I'm a bit hesitant to use the quote until I can source it. Is the "mob rule" quote sourced? Timothy Dwight quote about Jefferson? For what end shall we be connected with men of whom this is the character and the conduct? Is it that we may assume the same character and pursue the same conduct? … Is it that we may change our holy worship into a dance of Jacobin phrensy …? Is it that we may see the Bible cast into a bonfire … and our children, either wheedled or terrified, united in chanting mockeries against God …? Is it that we may see our wives and daughters the victims of legal prostitution; soberly dishonoured; … the loathing of God and man? The version of Jefferson's quote about the Ambassador from Tripoli and the Koran that appears in Hitchen's article in Slate and his books has a mistake. It has "answered their authority" where it should have "acknowledged their authority", as well as variations in spelling, capitalization and articles. The version in Diplomatic Correspondence of the United States 2:342 (1833) also has some slight mistakes, so I linked the version from Thomas Jefferson Travels: Selected Writings, 1784-1789, by Anthony Brandt, pp. 104-105. This matches the version in The Papers of Thomas Jefferson 9:358 and the original at the Library of Congress (paragraph 2 of Image 431). Too much detail, I know, but somebody questioned the authenticity of the quote, so I thought I'd include everything. The ambassador answered us that [the right] was founded on the Laws of the Prophet, that it was written in their Koran, that all nations who should not have answered their authority were sinners, that it was their right and duty to make war upon them wherever they could be found, and to make slaves of all they could take as prisoners, and that every Mussulman who should be slain in battle was sure to go to Paradise. “The issue today is the same as it has been throughout all history, whether man shall be allowed to govern himself or be ruled by a small elite"-Thomas Jefferson. "The Jefferson apocrypha, according to his research, may be sourced to a 1980 tract on regulation, in which a similar comment appears as the author's interpretation of Jefferson's argument in an 1813 letter to John Adams." Draft Constitution for Virginia (June 1776) This quote often appears with the parenthetical omitted and with the spurious extension, "The strongest reason for the people to retain their right to keep and bear arms is as a last resort to protect themselves against tyranny in government". is in the sourced section, and also listed in the miss attributed section. It is true that Jefferson did not say this. However, the article also says that this quote is falsely attributed to Benjamin Franklin. Numerous sources (such as this one which provides a handwritten letter from Franklin) attest that Benjamin Franklin proposed a similar phrase, "Rebellion to tyrants is obedience to God," as the motto of the United States. The confusion arises because Jefferson loved this motto and endorsed it, so it has been falsely attributed to him. A similar quote may have been used earlier by Simon Bradstreet, as the article says, and this may have been the inspiration for Benjamin Franklin's quote, though I haven't been able to confirm this. I will also make a note on Benjamin Franklin's Wikiquote page and update both pages with sources. I created this discussion topic so that anybody who disagrees can provide evidence that Franklin did not propose this as the motto and more importantly to request that anybody who has any information on a possible link between Franklin's quote and Bradstreet's quote can provide sources showing how they are related. Is this a legit quote? Laws that forbid the carrying of arms...disarm only those who are neither inclined nor determined to commit crimes. Such laws make things worse for the assaulted and better for the assailants. They serve rather to encourage than to prevent homicides, for an unarmed man may be attacked with greater confidence than an armed man. Truth will do well enough if left to shift for herself. This quote is from John Locke (from A Letter Concerning Toleration, 1689), not Jefferson. In questions of power let no more be heard of confidence in man, but bind him down from mischief by the chains of the Constitution. "Widespread poverty and concentrated wealth"? This page was last edited on 6 January 2019, at 18:23.